The UW EcoCAR team combines talented students from across disciplines, including engineering, communications, and business majors, to transform a conventional car into the most energy efficient vehicle possible. Each EcoCAR challenge is a multi-year competition among schools across the country. Each team is given the same car to start, and participate in yearly competitions to show of their designs and test their cars. The competitions cover several stages, including design, implementation and real-world testing. 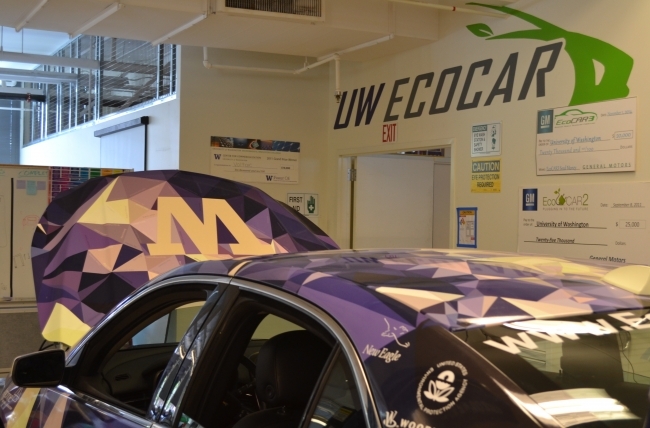 UW has been participating in EcoCAR challenges since 2011, earning second place in the EcoCAR2 competition in 2014. The competition is sponsored by General Motors, and builds on a proud 25-year history of U.S. Department of Energy (DOE) Advanced Vehicle Competitions that aim to minimize the environmental impact of personal transportation. The UW EcoCAR2 team was the only group to have a fully functioning car at the end of year two in 2013.